ダミアン・ハースト 「New Spot Prints」Damien Hirst "New Spot Prints"
We are pleased to present “Damien Hirst: New Spot Prints” as the inaugural exhibition of 8/ ART Gallery/ Tomio Koyama Gallery. 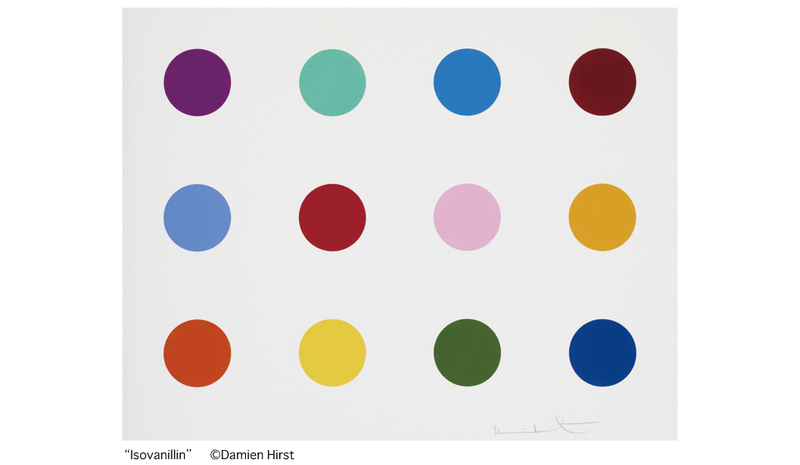 Damien Hirst is one of the most famous artists working today. His provocative works, such as the huge shark in formaldehyde that caused a sensation in the early 1990s, have shocked the art world as well as the general public and demonstrated new possibilities of artistic expression. He engraved his name in the history of contemporary art as the leading figure of the YBA (Young British Artists). In parallel with these dramatic works on the theme of life and death, he created another world of art that was very rational and systematic. One of the best examples is the Spot Painting series. In these paintings, colorful spots are arranged regularly on a white canvas, setting up interactions between themselves that go on into infinity. The spots are said to refer to pills. The titles, such as Probucol (an antioxidant) and Manganese Chloride, all refer to drugs or chemicals. A major Hirst retrospective opened at the Tate Modern, the largest contemporary art museum in the U. K., on April 4. We hope you will enjoy the new “Spot” series of woodblock prints at 8/ ART GALLERY/ Tomio Koyama Gallery. Damien Hirst was born in 1965 in Bristol, England. Solo exhibitions include "The Agony and the Ecstasy," Museo Archeologico Nazionale di Napoli, Naples (2004); "A Selection of Works by Damien Hirst from Various Collections," Museum of Fine Arts, Boston (2005); Astrup Fearnley Museet for Moderne Kunst, Oslo (2005); "For the Love of God," Rijksmuseum, Amsterdam (2008); "No Love Lost," The Wallace Collection, London (2009); "Requiem," Pinchuk Art Center, Kiev (2009); and “Cornucopia,” the Oceanographic Museum of Monaco (2010). "Damien Hirst", Tate Modern, London (2012). He received the Turner Prize in 1995.